Anna Cecilia Zip Nursing Bra NOW 75% OFF! 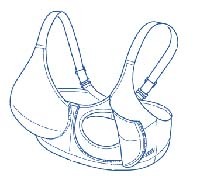 Special Features: The Anna Cecilia Zip Nursing Bra, featuring a unique inner lining, and easy-to-use zippered cups, offers maximum comfort and support for easy and discreet breastfeeding in any situation. The lining stays between your tender breast tissue and the zipper so there is no chance of catching anything in the soft nylon zipper. It is definitely a quiet one hand operation! Shape and Fitting: These fit most every shape nicely but we are finding in the larger sizes (D to G) they are running about one cup size big compared to our standard. Washing Instructions: Machine wash warm with like colors. Line dry. Back: V-shaped back with three positions. Size: White sizes: B = 32-38, C,D,E,F = 32-40, G = 34-40. Black sizes: B = 34-38, C,D,E,F,G = 34-40. We are discontinuing this line so the only sizes that we have in stock are reflected on the drop down menu.